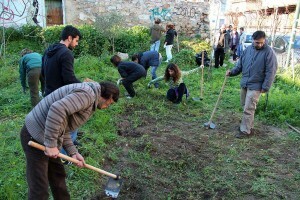 Urban cultivation of Community gardens. The garden is a heterotopia according to Foucault. “We should not forget that the garden, a wonderful creation of thousands of years old today, in the east had deeper as well as overlying meanings. The traditional Persian garden was a sacred space which should connect at the center of the rectangle the four points which represent the four cardinal points, with a more sacred area than others, which was like navel, the navel of the world with its center (where the basin and the fountain were located). The vegetation of the garden should be allocated in this area, in this microcosm. Regarding the carpets, originally they were garden representations. The garden is a carpet where the whole world succeeds its symbolic perfection, and the carpet is a kind of mobile garden in space. The garden is the smallest part of the world and is also the whole world. From the depths of antiquity the garden is a kind of happiness and universal heterotopia “. The creation of gardens in urban spaces and the planting of seeds and trees in them are artistic practices. As it was done in Lower East Side in New York, in Stavroupoli in Thessaloniki and in Ag. Asomaton Square). It regards the relationship with the land that has to do with the labour, and the food, with the leftovers of nature in the city that are approached with the defense of traditional varieties of seeds. The community is created through the cultivation of plants, in a space that is a heterotopia, the garden. A story about the multiple faces of violence and war in the city center. The search for an empty space in the city center to create a self-managed Community Garden was an idea that had begun long ago, with the impact of community gardens that have existed for years in other cities, and after the trip and participation of Nomadic Architecture in an action in jardino Parajiso in Manhattan, at Lower East Side. Navarino Street Park had a significant influence as well as other struggles for public space in Athens, such as the try of the activists to claim Filopappou hill to remain free, for the Elliniko, for the Cyprus and Patision Park, and for the park in villa Drakopoulou etc. Communal self-managed gardens in the historic city center are a bet, an important claim and a symbolic gesture of cohabitation of diversities in an area with​​omnipresence of the police and its residents who were, at that time, homeless people, immigrants hiding to avoid their closure in camps, HIV-infected prostitutes that were jailed, immigrants with carts living by the things they collect and sell from the garbage. The homeless, the young unemployed, the craftsmen who are worried about the very next day are many of the center’s residents. “Madre Terra- Migrant Trees” is a collaborative project by the Nomadic Architecture Network (Eleni Tzirtzilaki Stefanos Handelis), Georgia Traganou, Lydia Matthews, Natalia Roumelioti and Gabrielle Bendiner-Viani in cooperation with Parson’s, the New School for Design University. It comes as a sequel to “Open House”, an event presented under the umbrella of “Unbuilt”, the thematic series organized by SARCHA and hosted at the Byzantine Museum in Athens, Greece. Scheduled to take place on June 22nd, the current project consists in the symbolic gesture of planting a tree and seeds in El Jardín del Paraíso, a community garden situated at the Lower East Side of New York city. We will of course make a toast for the occasion and offer food seasoned with herbs we cherish as a living memory of the places they/we come from: Eleni and Stefanos will bring along herbs not only from Greece but also from other places where they have lived, including Italy, Cuba and Portugal. We will chart the paths taken by people over time that led them to the place they call home, the Lower East Side and we will talk about their gardening practices, daily life, how the community garden came to be etc.